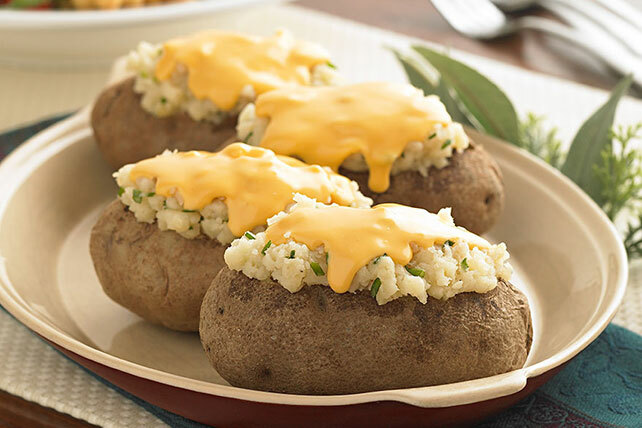 Double down on great flavor with tasty Twice-Baked Potatoes. These Twice-Baked Potatoes are served with classic ranch dressing, sour cream and cheese. Prick potatoes in several places with fork. Bake 1 hour or until tender. Reduce oven temperature to 350°F. Cut thin slice off top of each potato. Discard tops; scoop out centers, leaving 1/8-inch-thick shells. Mash potatoes. Add dressing, sour cream and onions; mix well. Spoon into shells; top with VELVEETA. Place in shallow baking dish. Trim 50 calories and 12g fat, including 4.5g saturated fat, per serving by preparing with KRAFT Lite Ranch Dressing, BREAKSTONE'S Reduced Fat or KNUDSEN Light Sour Cream and 2% Milk VELVEETA. Serve this potato side dish with a crisp, mixed green salad or hot steamed vegetables and cooked lean meat, poultry or fish.